A woman beekeeper discovers a dead man in her hives and within 10 minutes into the book, she becomes the prime suspect as the victim is none other than her sworn enemy! 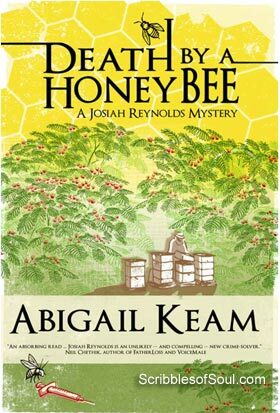 As soon as I began reading Death by a Honeybee written by Abigail Keam, I had an inkling that I have hit upon a jackpot and this murder mystery is going to be an entertaining read. And, it indeed turned out to be great fun exploring the Bluegrass lands of Kentucky as our middle aged heroine, Josiah Reynolds grappled with the not-so-legal intentions of an overzealous cop and a spew of threatening letters. To make matters even worse, murder mystery soon becomes the talk of town as the victim Richard Pidgeon was a bee charmer, he was never stung by a bee before, so how come he died in Reynold’s beehive. Is Josiah somehow involved in the murder or is she just a victim of circumstances, were the questions that wrangled friends and foes of the unfortunate retired professor. As Josiah ran from pillar to post, digging out Richard’s past and even messing with his stinking garbage, many more skeletons tumbled out of the proverbial cupboard, complicating the simple tale. Slowly, more characters entered the story. A friendly gay couple Matt and Franklin, the hot shot lawyer Shaneika, the lesbian nurse, the mother-daughter duo and Josiah’s own daughter (who remains an enigma and only appears on phone calls) enhanced the scope of the novel from a simple murder mystery to a well rounded detective story. The mystery deepened with every chapter throwing a new motive and suspect and I had a great time reading this fast paced eBook from Amazon. The setting of the novel is unique. Kentucky enjoys a historic past and Abigail has made very good use of the land of blue grass and thoroughbred horses, emphasizing its mixed Indian American culture. The narrative is written in simple prose, with a liberal sprinkling of slang and colloquial words, giving it a specific regional flavor. Josiah and Matt’s obsession with old movies and actors also gave a very familiar life like tone to the novel. The finer nuances of bee keeping and the marketing style of farmers in a sleepy town, that gets hyperactive only at the time of annual balls and competitions, were also presented with great style and I really loved Abigail’s portrayal of Josiah as a friendly, old lady, who is charming in her own frumpy way. When Josiah bribed his neighbors and friends with well cooked home food, I was transported into another world, where gluttony is the biggest sin. And, yet the town was shown to have an underside. Just like Josiah’s life, it also has many secrets buried beneath the lazy exteriors. It has its share of controversies including a strip joint frequented by lesbians and unstable police detectives who show no qualms while breaking the law. Despite many distractions, Abigail is able to keep the focus on Josiah Reynolds, who feels like a relic in the rapidly changing world and yet comes out on top, thanks to her quick wit and presence of mind. The storyline is unique and it is made even more exotic by Josiah’s ramblings about the historic Lexington, creative art pieces and antebellum homes. In short, I am impressed with Josiah Reylond’s first outing as a sleuth. Though, I think something derailed in the end. Most probably, the author got carried away in the last two chapters. In a desperate bid to resemble Agatha Christie, Abigail went for an overkill. The story had a good climax in Chapter 23, where law ceased to matter and Kentucky style of justice took over. I seriously feel Abigail should have left the story at that point, but in an effort to introduce the mystery writer and Josiah’s daughter, who would most probably play important role in the next book, the story was stretched a bit too far, spoiling the fun. But, still a bump in the end can hardly obliterate the silky smooth ride I enjoyed in Death by a Honeybee. Despite a few glitches, this new age mystery is surely worth a read.